2027. All of the people in the world are infertile. The youngest human, eighteen-year-old “Baby Diego” has just been killed and everyone is mourning. Theo (Clive Owen) is suddenly and violently approached by his ex-wife Julian (Julianne Moore) to assist in getting Kee (Clare-Hope Ashitey), a young, pregnant woman to safety. It’s an amazing thought – the human race dying out not from illness or disease but just not being able to make more. What drives people as a species to keep going? And what would really happen to the miracle – the occasional person who falls pregnant? This is not an easy film to watch. It’s violent and emotional and does not pull punches at any time. But it is wonderful, and beautiful, and I hope that I have the guts to watch it again sometime. 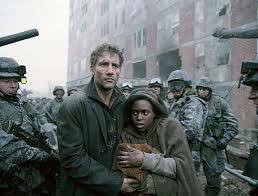 Children of Men was nominated for Oscars for Best Writing, Adapted Screenplay (Alofonso Cuaron, Timothy J. Sexton, David Arata, Mark Fergus, Hawk Ostby) Best Achievement in Cinematography and Best Achievement in Film Editing.